New Stanless Steel APPLIANCES - IF RATE QUOTE IS DESIRED, PLEASE REQUEST RATE QUOTE FOR EXACT PRICING. FOR EXACT PRICING AND DISCOUNTS, PLEASE ENTER DATES IN A PRICING REQUEST. For exact pricing details, please contact the Debbie at 9546581392. PLEASE NOTE VRBO LISTED RATES MAYBE A DEFAULT RATE, ACTUAL RATE VARIES BY DATE, SEASON AND MAY CHANGE DEPENDING ON DATE BOOKED. SPRINGS BUILDING! New upgrades include new slate entry, king bed and many more items to make your stay comfortable! NEWLY INSTALLED Stainless Steel Appliances. SLEEPS LIKE A 2 BEDROOM, EVEN HAS 2ND BATH Feels almost like a 2 bedroom, this *one bedroom* with *king bed*, spacious with a murphy bed, sleeper sofa and 2 full bathrooms. One of the few one bedroom units in River Run with a King Bed in master. The murphy bed folds up out of the way during the day and the unit will sleep up to 5-6 people when using the sleeper sofa. The unit is decorated in a tasteful mountain theme and is a true mountain get away! The unit is extra large for a one bedroom, one of the largest in River Run. It is designed for up to 5-6 people and the dining room table even sets 6! It has a full second bath in addition to the full bath attached to the master. The Springs is a 60 second walk to the Gondola, great pool area with rock slide, 2 hot tubs, has a movie room with theater style seating, pool table, great lobby with waterfall, work out room, sauna, fire pit - to many amenities to list. TREAT YOURSELF AND STAY IN ONE OF THE BEST BUILDINGS IN RIVER RUN AT A REASONABLE PRICE! The Springs is the newest building in River run (completed Fall, 2001) the Gondola which has recently been relocated right across the parking lot from our condo! It is just steps away from shopping, dining, the Children's Center, ticket sales, and equipment rental. The condominium sits on the East side of River Run, boasting a beautiful view of the Montezuma Mountains. Decorated in custom mountain lodge decor, this amenity-filled condo is complete with a fitness room, sauna and showers, multi-media room with a large screen TV and DVD player, kid's play room, 2 year-round outdoor hot tubs, a swimming pool with water slide, heated walkways, a fire pit, barbecue area, and heated underground parking. Our condo comfortably sleeps 4-6 with a RARE King size master bed in the one bedroom, queen sleeper sofa, and queen murphy bed. The Springs condo is designed for year round fun ranging from skiing, sledding, and snowmobiling to swimming, hiking, running, biking, sailing, golfing, and fishing. Keystone has it all! - Master in one bedroom with RARE King Bed, TV, storage chest, attached full bath, the most beautiful and peaceful view you will ever wake up to! - Main area has Queen Murphy bed between living and dining room that easily folds down without moving items to sleep additonal guests. - Living room contains rock fireplace with timer, to enjoy while relaxing after a busy day. - Sofa in Living room pulls out to a resort quality sleeper sofa. - 2nd full bath is off the main living area which provides privacy for all quests! - Dining room sets 6, offers views of mountains, TV, and fireplace. - Kitchen is fully stocked for a family meal or a quick snack. - The Springs is the most family friendly of all buildings in River Run! - The pool has a water slide that is feed from an spring inside the lobby of The Springs. - Two Hot tubs with a fire pit near the pool area. - The Springs is also quiet and safe for the entire family. It is a free standing building without any bars or retail located in the building! - One of the few one bedroom units that has a King bed in Master. - We have an onsite property manager, this service does NOT cost you any extra charges. The managers office is located in Keystone and is fully staffed 24/7. - They can offer ski rental discounts, transporation, car rental discounts and many other services. - We are owners that want for you to enjoy a hassle free vacation and we are not absent owners. We love the beauty of Colorado and The Springs offers unmatched Colorado fun. We enjoy River Run, but wanted a quiet and peaceful place to enjoy our time in Colorado. Our Springs condo combines the best in a family vacation - location, great fun for the kids, work out room and beautiful views for the adults and will never disappoint! Movie viewing room, kids play room, work out room, pool with rock slide feed from spring inside lobby, pool table, beautiful lobby and comfortable for the entire family - young and old alike. Fire pit outside, walking bridge linking River Run to the Springs, quick walk to any place in River Run. In River Run, but does not have any retail, or bars in the building - this insures a safe and peaceful vacation. Coin operated machines directly across the hall. Everthing you need to make your stay a home away from home including a convection oven. Beautiful view of Buffalo Ridge from the balcony. A great place to sit and drink your coffee in the morning! Faux rock which is heated surrounds this beautiful and entertaining swimming pool with waterslide. Baby pool is adjacent to main swimming area along with a play area. (2) Great view of the slopes from the hot tub. Fun to watch the fireworks on the mountain in winter from this location! 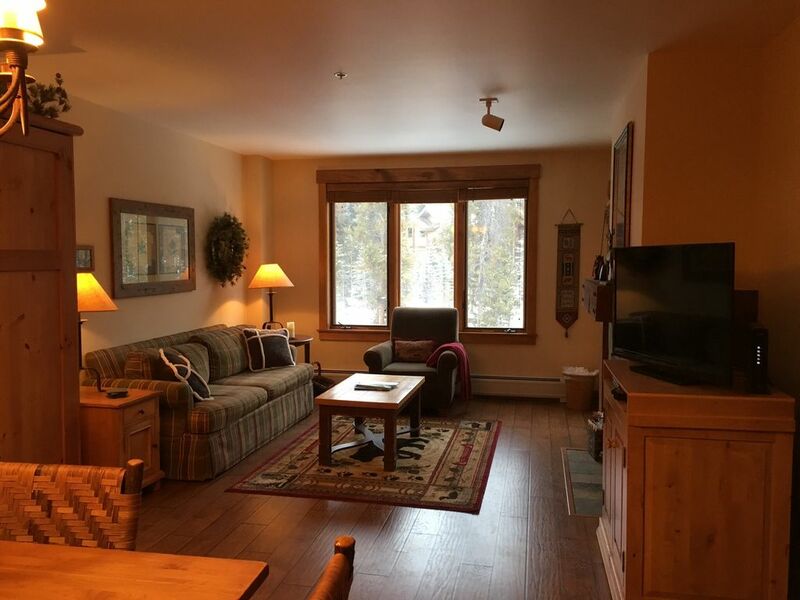 Very convenient condo right next to the River Run Gondola and ski school. Debra K.Where do you live? My two grown sons and I stayed here for two nights. It was a perfect ski in ski out spot at as reasonable a rate as you’ll find in Colorado. You are a few minute walk to ski lifts and Keystone Village. The building had lovely amenities, including large outdoor hot tubs and a small pool. Lots of families staying here, which we liked for the low key vibe, but consider that if you are in a more partying mood. . The beds were comfortable. Excellent kitchen amenities. Indoor parking simple in and out was great too. We are so glad you enjoyed your stay, please visit us again! The unit was clean on arrival and we enjoyed our stay here very much. Unparalleled convenience to the gondola makes things so much easier. The unit was clean on arrival and some essentials were in the cupboard--salt, pepper, oil, some spices, coffee filters and sugar. Only downer was that the previous guest had apparently cooked 3000 hamburgers with onions before they left--smell was pretty strong the first 24 hours. Still, a minor blip of an otherwise great stay. Wonderful location. Very clean and had all the necessities. Thank you for staying in our condo. We are glad you found it comfortable. Very nice condo, close to the gondola. The only issue we had was they had 2 humidifiers that were not working, so we called the management company and they brought 2 new ones the same day. Would definitely stay here again. Damage Insurance Waiver of $60 dollars covers up to $1500 loss or damage. We had a guest loading diswahser her toddler sat on door - broke it off, she did not have to pay for dishwasher. Another guest broke a window, again did not pay for damage. Priceless, good for wine glasses left at pool or toddlers sitting on diswasher doors!